Although combination antiretroviral therapy (cART) has improved survival of patients infected with HIV and has reduced the incidence of severe neurologic complications, almost half of cART-treated HIV patients experience some degree of neurocognitive impairment (neuroHIV). To search for underlying pathology, scientists analyzed the brains of monkeys infected with simian immunodeficiency virus (SIV) then treated with cART. As reported in a new study in The American Journal of Pathology, the majority of the SIV-infected macaque brains showed signs of unusual lymphocyte-dominant inflammation, suggesting that persistent neuroinflammation may underlie cognitive problems in cART-treated HIV patients. “In our well-characterized model of neuroHIV, most untreated SIV-infected animals develop classic HIV-associated encephalitis rich in macrophages and multinucleate giant cells bearing replicating SIV. 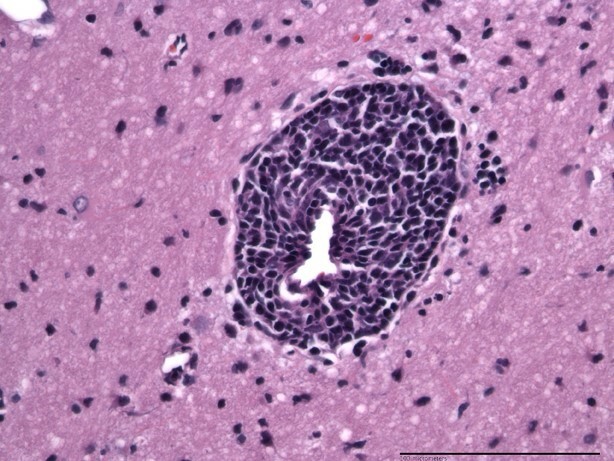 Using this model, we expanded our research to study neuroHIV in the context of current therapy by treating these animals with cART,” explained lead investigator Joseph L. Mankowski, DVM, PhD, of the Department of Molecular and Comparative Pathobiology at Johns Hopkins University (Baltimore, MD). “These findings suggest that lymphocyte-dominant encephalitis in cART-treated SIV-infected macaques is associated with residual or re-emergent low-level viral replication in the CNS despite cART,” said Dr. Mankowski. Hence, adjunctive immunomodulatory therapies may be useful in patients with HIV manifesting HIV-associated neurocognitive disorders. The article is “Lymphocyte Dominant Encephalitis and Meningitis in SIV-infected Macaques Receiving Antiretroviral Therapy,” by Lisa M. Mangus, Sarah E. Beck, Suzanne E. Queen, Samuel A. Brill, Erin N. Shirk, Kelly A. Metcalf Pate, Dillon C. Muth, Robert J. Adams, Lucio Gama, Janice E. Clements, and Joseph L. Mankowski (https://doi.org/10.1016/j.ajpath.2017.08.035). It will appear in The American Journal of Pathology, volume 188, issue 1 (January 2018) published by Elsevier. Full text of this study is available to credentialed journalists upon request; contact Eileen Leahy at +1 732-238-3628 or ajpmedia@elsevier.com. Journalists wishing to interview the authors should contact Vanessa Wasta, Communications Manager, Basic Science Research, Johns Hopkins Medicine, at +1 410-955-8236 or wasta@jhmi.edu. This research was funded by NIH awards R01NS097221 (JLM), R01NS089482 (JLM), R01NS077869 (JEC, JLM), T32OD011089 (JLM), P40OD0131117 (RJA), P01MH070306 (JEC), K01OD021323 (SEB), K01OD018244 (KMP), and the Johns Hopkins University Center for AIDS Research P30AI094189.